Here we explore the Concept of Gesture and there are many useful exercises. Frankly, the Beginner’s Lounge is probably more useful at this point than this one. 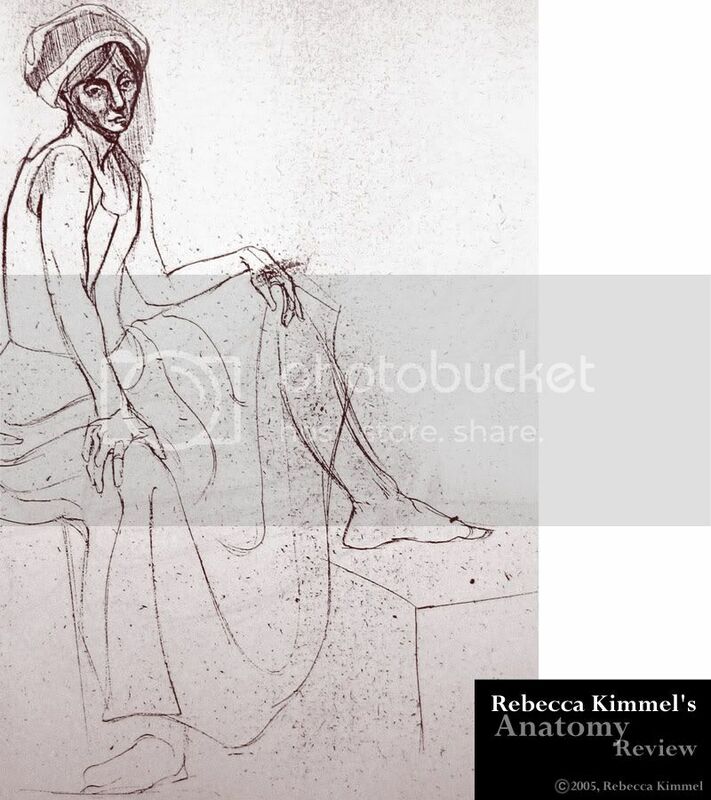 Welcome to the inaugural thread of Rebecca Kimmels Anatomy Review. Hopefully this will be one of many “tutorials” that I will be writing about the core concepts concerning drawing the human figure in an artistically anatomical way. So bring your drawing pads, sketch books, your wacoms and your pencils & pens, and lets start drawing. Gesture drawings may seem basic, but their importance cannot be overlooked. Gesture is the heart and soul of a drawing  without first establishing the clean, economical sweep of lines (and subtle shading) to quickly define the human form in its entirety, an artist drawing from a model (or reference) can quickly become lost. 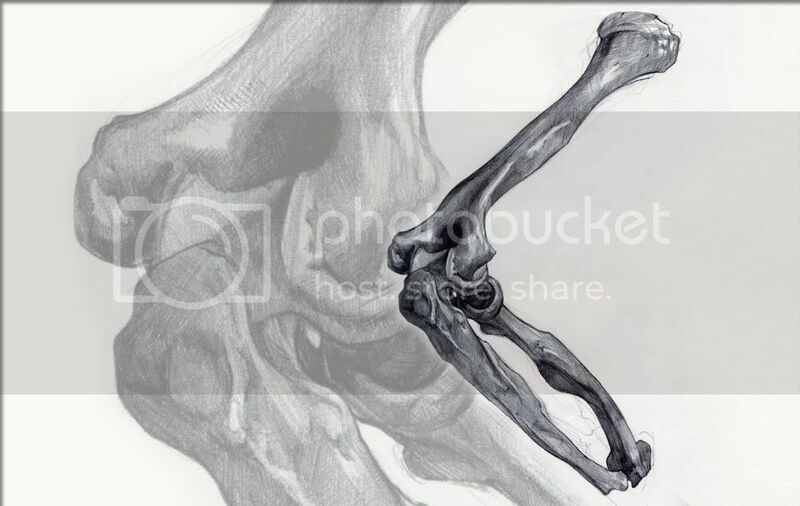 Beginners tend to focus narrowly on details, and never establish the full figure. It is critical when drawing to focus instead on the BIG PICTURE. 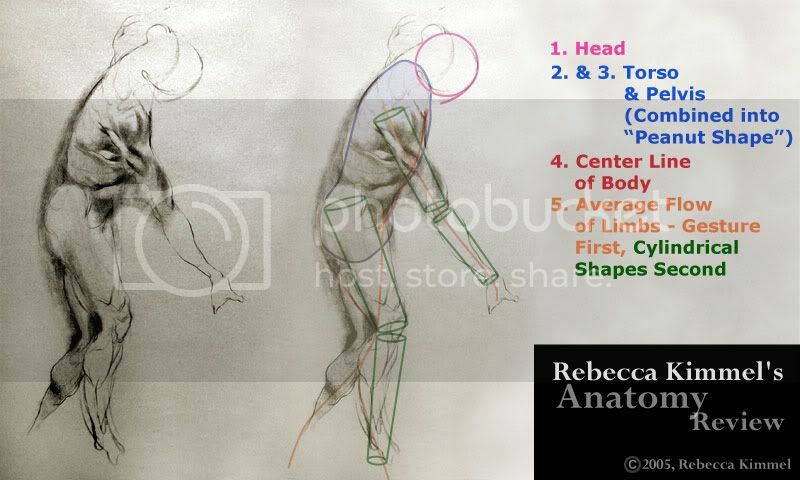 [li]Direction of HEAD[/li][li]Direction of RIBCAGE[/li][li]Direction of PELVIS[/li][li]CENTER LINE OF BODY[/li][li]Flow of LIMBS[/li][/ol]Note: Gesture Drawings are drawings that take only up to 2 minutes to complete. So thats it. Go now, pick that sketchbook up, and practice drawing GESTURES. My advice is to do several and then pick the best one to post here. YOU HAVE ONE WEEK TO POST YOUR BEST PIECE (GESTURE DRAWING). This will be the CORE thread, created by Rebecca Kimmel, where the lessons will be posted along with the FINAL pieces done by the participants. [li]You are encouraged to use MODELS but if you cannot you can use PHOTO reference. [/li][/ul]At the end of the week, I will pick up to 4 pieces of my choosing and will review them. My advice: KEEP IT SIMPLE. DISCLAIMER: The creator of this thread, Roberto Ortiz, Rebecca Kimmel, CGNetworks and CGTALK are not responsible for what happens during these classes. Participants are posting under their own accord and their actions are their own. The aforementioned parties of Roberto Ortiz, Rebecca Kimmel, CGNetworks and CGTALK are in no way responsible for their actions and are thus not liable in any way. Hey Rebecca, good to see this getting off the ground. This lesson looks like a good one to start with, and I’m going to give it a shot, since gestures are probably one of my weaker areas. Cheers! I will definitely be posting. 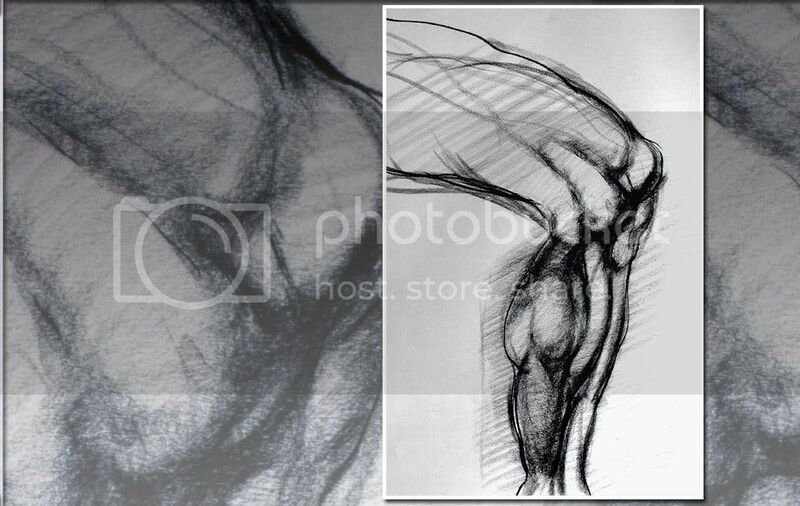 I’m currently learning out of Burne Hogarth’s (awesome) Dynamic Anatomy book. Love Burne Hogarth!!! DISCLAIMER: The creator of this thread, Roberto Ortiz, Rebecca Kimmel, CGNetworks and CGTALK are not responsible for what happens during these classes. Participants are meeting under their own accord and their actions are their own. The aforementioned parties of Roberto Ortiz, Rebecca Kimmel, CGNetworks and CGTALK are in no way responsible for their actions and are thus not liable in any way. hang on, but i poured coffee in my lap, broke my arm, developed an ulcer, put on 20 pounds while straining my eyes after cramping my neck trying to read this post and your saying its MY fault!? and you say you studied under Hogarth! i am very jealous, he is an amazing artist, his books have taught me so much. excellent… now just to find a model… AH! the zoo! 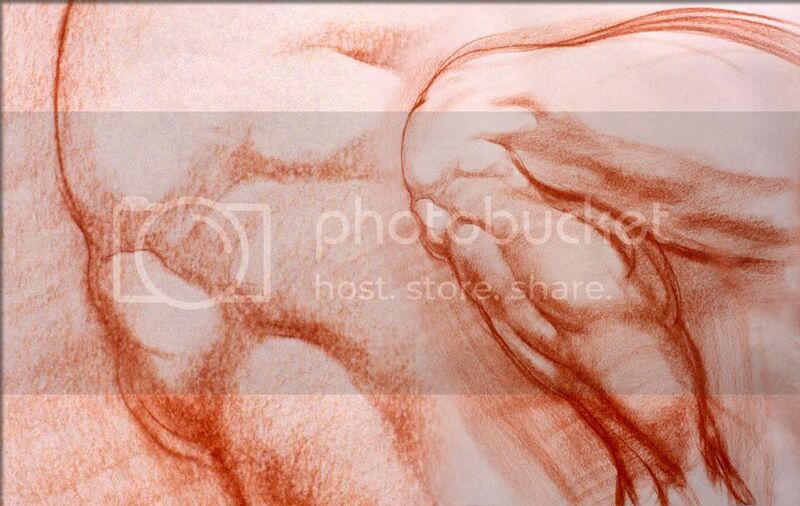 Well here is one of my gestures that I liked. It isn’t much compared to what I’m sure will be posted, but I’m working hard to improve! I would love tips anyone has. Thank you for your posts! Supply-wise, you are welcome to use any medium with which you feel comfortable – personally, I’m going to be posting charcoal drawings, maybe with some Photoshop additions, but these posts are essentially meant to be more demonstrative in terms of ideas about approaching figurative drawing, and less about using a specific technique. Here is a list of Anatomy Reference / Figurative Drawing / Artists’ Drawing books which I have in my “library” – eg, set of Target shelves – feel free to post the titles of books which you have found helpful and maybe I can convince Roberto to create a sticky for them! Clearly, you don’t need all of these! The best thing to do is hunt a few of the top INSTRUCTIONAL books down online or in the bookstores, and see what you like best. 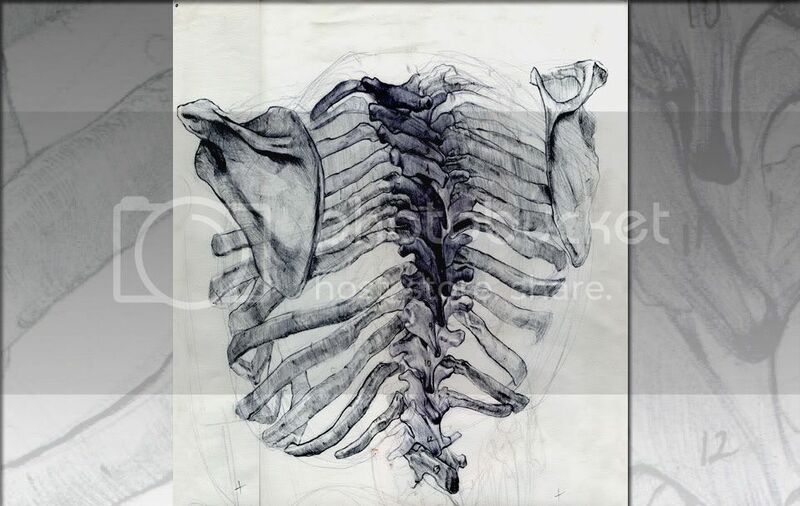 So long as the books that you find contain reference including the skeleton in front, back, and side view, as well as the muscular and surface structures in these three views, you should be fine. Often, artists like to have several books on hand, however, as each reference book can offer something unique, even if the same subject matter is covered. In terms of books about ARTISTS, everyone should have a book containing Michelangelo’s Drawings and Paintings in my opinion! After that, Rubens. After that, Pontormo. These are just my three favorite artists that I drool over. But definitely collect books on artists you love and never loan them! Thanks for doing this Rebecca! I’ll definitely be giving this a shot. Hey guys, I just wanted to post some of the images that were used in the announcement thread in the hopes that they could give you a better sense of where I am coming from artistically. Thank you for your posts and participation! Rebecca five stars from me for such a grate thread! I’m in this fo’ sure babe! check ya later! Excellent idea starting this thread! Wow…this is like a free course…I love the idea…Cant thanks Bobby and Kimmel enough. edit : no refs…This is not my final submission…so i hope i can just edit this post to submit a different one…:bounce: CAn I? A few more…pls tell me if im doing it right or not…ive never taken any class such as this. 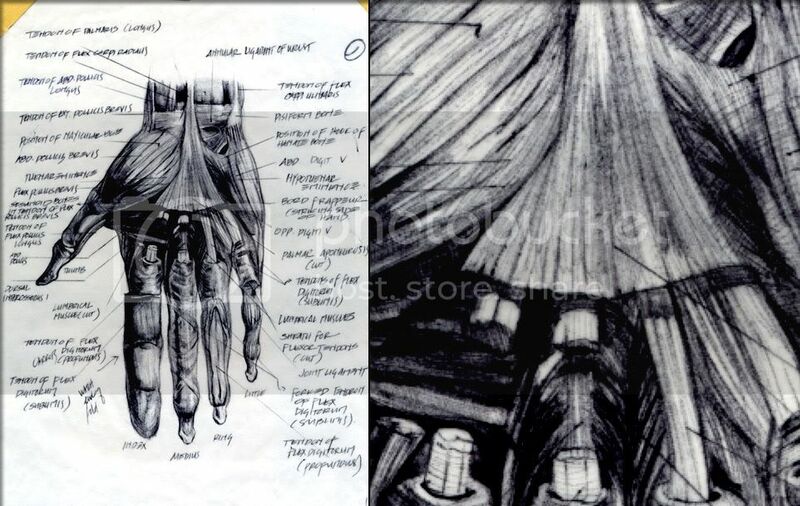 Again…no refs…The first 2 sketches are manual on copy paper. The one above here is done with wacom. oh Rebecca im ready for your crits…if these are worth your crits at all!! At the end of the week I will just update this reply to a single final gesture…its that ok?